This important, privately published catalog is very well-done and is a welcome addition to the reference libraries of both American Brilliant cut glass collectors and collectors of Nakara and Wavecrest. The catalog contains 152 pages and is a reprint of C.F. 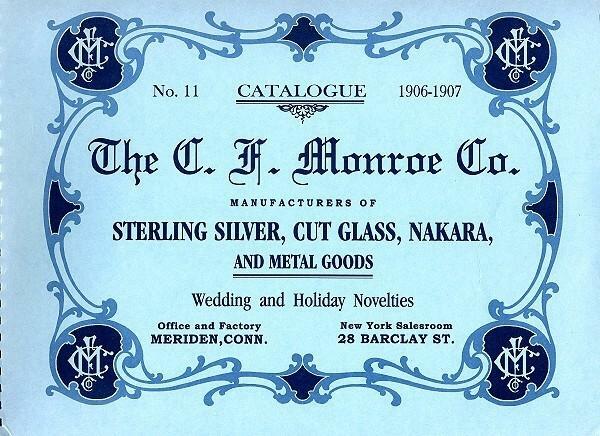 Monroe’s No.11 catalog for 1906-07. The catalog illustrates 79 pages of rich cut glass, 18 pages of sterling, 29 pages of the opal line of Nakara and 8 pages of metal goods. The other pages show the interior of the New York store, the Meriden factory, C.F. Monroe ads, an index and history as known when the catalog was reproduced in 1998. In the early 1900s, Rich Cut Glass was introduced followed by Nakara, Kelva, Sterling and metal novelties. By 1916, the company closed its doors. The $23.00 cost includes postage for media mail.